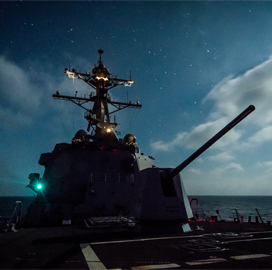 The U.S. Navy test-fired 20 hyper velocity projectiles from guided missile destroyer USS Dewey into the Pacific Ocean last summer, USNI News reported Tuesday. The ship fired the missiles from its Mk 45 naval gun as part of the effort to expand the weapon's utility against unmanned aircraft and cruise missiles, the report noted. The test was also part of the Rim of the Pacific 2018 international exercise that united the naval forces of more than 20 nations. The HVP's purpose is to launch from electromagnetic railguns. The Department of Defense sees the possibility of a new near-hypersonic missile defense weapon that would launch the HVP, the report noted.